FREE SHIPPING TO 48 STATES ON ORDERS GREATER THAN $50. MisterMax P-Bath Urine Pre-Treatment Conditioner is not an odor remover, it is an pH neutralizer that will negate the detrimental effects of other cleaners and detergents that failed to eliminate odors from carpet and fabric. This exclusive product contains a blend of anionic surfactants, compatible acids, and other special additives that will ready odorous dried urine for permanent removal. MisterMax P-Bath Urine Pre-Treatment Conditioner will improve the performance of Anti-Icky Poo odor removers and it should be used prior to applying Anti-Icky-Poo odor removers. Anti-Icky Poo contains enzymes and live bacteria that literally eat urine crystals and other odor causing contaminants. Even the residue from dried cleaning products can attack the helpful bacteria in Anti-Icky-Poo. With the use of MisterMax’s P-Bath, you are most likely to have a speedy resolution of your odor removal problem. MisterMax P-Bath Urine Pre-Treatment Conditioner will remove yellowing, stabilize urine affected dyes, neutralize quaternary disinfectants and rebalance a high pH Alkalinity. P-Bath is very compatible with stain-resistant materials. Apply the P-Bath solution liberally onto the affected area, let it soak in for 15 – 30 minutes, that extract with hot water and clean towels. Immediately apply Anti-Icky-Poo odor removers after extraction. The MisterMax P-Bath Pre-Treatment is a unique product designed to neutralize the acids in your carpet prior to treatment with Anti-Icky-Poo. Many people have tried products such as vinegar or cleaners that simply mask over the pet odors when trying to remove cat urine stains and odors. The P-Bath Pre-Treatment eliminates the acids and odors those products cause so that the Anti-Icky-Poo can work it's magic. 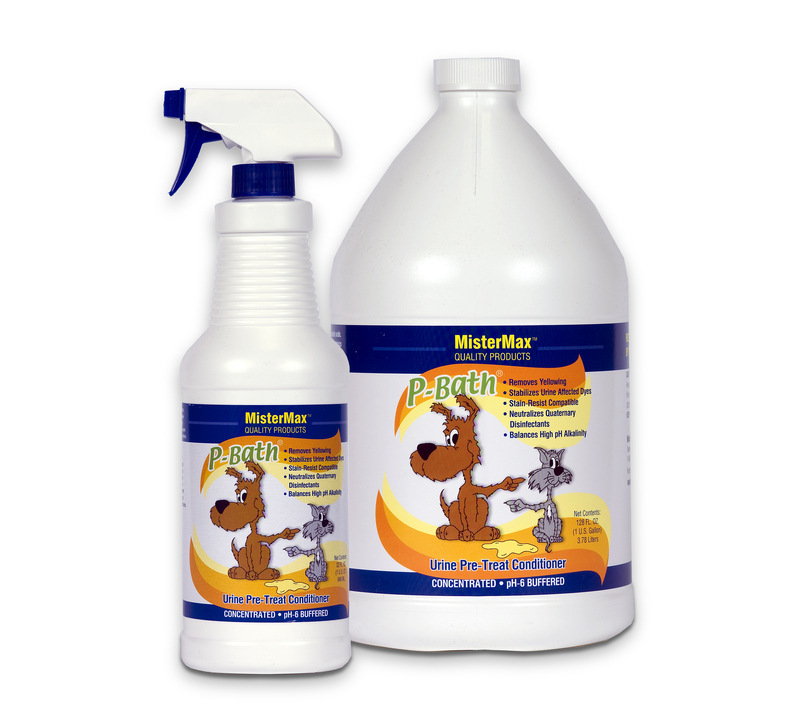 Simply Spray, inject, or pour the P-Bath Pre-Treatment on any surface prior to treating with Anti-Icky-Poo. Allow to dry and then treat normally. I was hopeful that speaking to customer service and following the directions would totally eliminate the cat urine from our thick foam couch cushions (she went between them-lovely I know). After P-Bath and 3 applications of the AIP, most of the smell is gone.